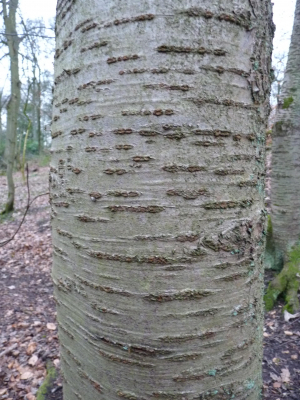 A close up of one of several similar trees showing the bark colour and their distinctive horizontal lenticels. The tree is in a wood with large trees around it providing a rather dense canopy in summer. Its girth is not large and it appears to be a young tree. There are no low branches for twigs to be examined as the tree is growing tall to seek out light. Leaves on the woodland floor seem to be a mix but mainly beech ( not surprising given the abundance of beech trees in the wood). Doesn't look like any beech tree bark that I've seen in guides. I would appreciate help in identifying this tree.